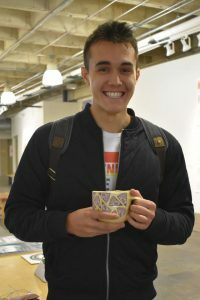 The aim of the Ron Gallas Cup Library is to make handmade ceramic cups more accessible to the St. Olaf community and, in doing so; build an appreciation for and awareness of the tradition of handmade functional pottery through tactile observation. Reserve a suite of cups for your next meeting or event on campus! Faculty, staff, and students can borrow cups for a week at a time. Faculty/Staff are also eligible and encouraged to check out a suite of cups for meetings, etc. Suite reservations require a minimum of 24 hours advance notice with 48 as preferable. 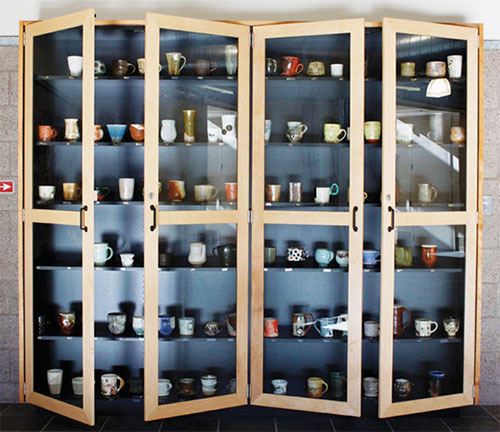 Suite requests are placed by sending an email to cuplibrary@stolaf.edu. In your message please indicate the number of cups requested, the day/time of the pick-up, and when the cups will be returned. Minnesota is home to a rich tradition and community of ceramic artists. To them, using handmade objects is an essential way to communicate and learn from one another. While this clay hot bed exists locally, citizens often overlook the global significance of this culture because they are unfamiliar with influential clay practices in the United States. Ron Gallas, a student of Warren MacKenzie’s and himself a Minnesota native, has long been a link to the regional ceramic legacies and community. For Ron, cups are a form of currency. He has always expressed his appreciation, gratitudes, and regrets, by placing a cup he made into another’s hand. It is because of this generous quality he possesses that the cup library will be named after Ron. 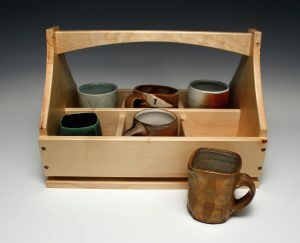 It will honor his legacy and commitment to ceramics at St. Olaf College. SPOTLIGHT: Cups to Go. Originally published in April 2017 issue of Ceramics Monthly, page 80. http://www.ceramicsmonthly.org . Copyright, The American Ceramic Society. Reprinted with permission. The digital age is slowly disintegrating the connection we have to quality handmade objects for daily life. We find that many students have never used a handmade cup. They cannot remember the last time a cup enhanced their drinking experience and made them more aware or attentive to what and how they are consuming. As well, many students are also unable to name a historically significant or contemporary ceramic artist. See artists in the collection. If you have questions about the library please feel free to email them to cuplibrary@stolaf.edu. 8 a.m. – 12 p.m. | 1 – 4:30p.m.